If memory serves both of those cars (A3 & A4) share the same basic engine (VW EA888 Gen 3). It's also shared in my wife's Q5 and my VW GTI, among other vehicles in the lineup. The major difference that I believe can be attributed to the various plug change intervals are the state of tune. The A3 has between 180 and 220 horsepower, the A4 is over 250. To get that from the same engine they need to turn up the boost pressure on the turbo, which will be harder on the engine. The extra pressure and heat from adding a turbo to an engine is not insignificant. To combat the wear the maintenance needs to be done more frequently to keep things fresh and working correctly. So, unless I have misread wife's A4 Quattro maintenance schedule it calls for an engine air filter replacement at 60,000 miles. Is that indeed the case? That sounds totally nuts to me. I generally replace the engine air filter every 20,000 miles. I'm not comfortable with an oil change interval of 10,000 miles so I change every 5,000 miles. This regimen (together with yearly cabin air filter changes, timing belt/water pump/spark plug replacement per Acura maintenance schedule and auto trans fluid changes every 30,000 miles) has kept my 04 TL in excellent running condition over 172,000 miles and 15 years with no major mechanical issues other than one a/c compressor (Denso OEM delivered to my door last summer for $225) and one throttle position sensor taken care of at dealer for $400 -- nothing else at all other than usual maintenance). The NSX at now 25 years old but only 53,000 miles has had next to nothing in the way of mechanical issues/repairs. This is in stark contract to my A6 experience over the last 3.5 years/35,000 miles. Mitigating my predisposition described above, I have over maintained my A6 but that has not resulted in quite the trouble-free experience I had been hoping for. 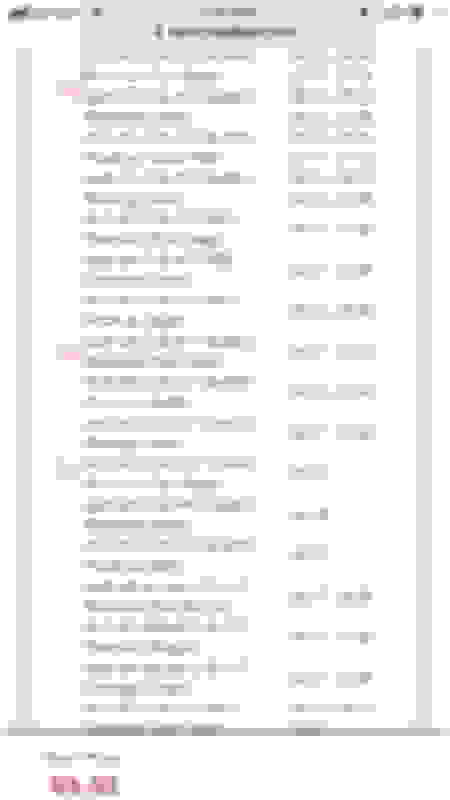 As such, as pertains to our leased A4 I'm not going to bother doing anything up and above what is called for in Audi's maintenance schedule (so since I have Audi Care no more maintenance costs). Treating the A6 so well has not prevented a myriad of problems so I'm at the point of just thinking, why bother? As for the NSX and the old TL I'll stick with my "old school" maintenance regimen. They are long term keepers which the Audis are not for me. And yes, I recognize that Honda/Acura may not be what it once was. That's very disappointing and I wonder if part of it has something to do with all the tech that is now part and parcel of these cars -- none of them including the Audis are as simple as back in the 90s and early 2000s. Old guy question: is this progress? Acuransx, you are correct. Air filter is supposed to be OK for 60,000 miles. I too am skeptical at service intervals today. I perform all the basic maintenance on our cars. Oil changes at 5,000 miles intervals, brake fluid at 2 year intervals. I think one factor is cost of ownership. If you can avoid changing air filters, plugs, etc. for that length of time, it makes that famous "5 year True Cost of Ownership" much more competitive. People will spend a boatload on a car purchase, but to spend it on maintenance is counter to conventional thinking these days. Conventional thinking not so smart IMHO. This trend to little maintenance is a reason I'll never buy a CPO car other than possibly a dealer loaner/demo. Pity the person who gets an expensive German car that has had oil changes every 10K miles or less frequently. I've been looking at the Audi maintenance schedule to, so let's switch from brakes to plugs. A4 says plugs at 40k miles, A3 says plugs at 80k miles. What's the difference? My guess would be that one engine is using copper plugs, the other is using iridium or platinum. It's one of those things I do not completely understand - domestic or Asian automakers tend to use iridium/platinum plugs with ~100K mile (160K km) replacement intervals, while there are lots of German cars that are using copper plugs that have much lower life spans. Why that is, I don't know. I’ve been looking at plugs myself and it can be confusing at times. 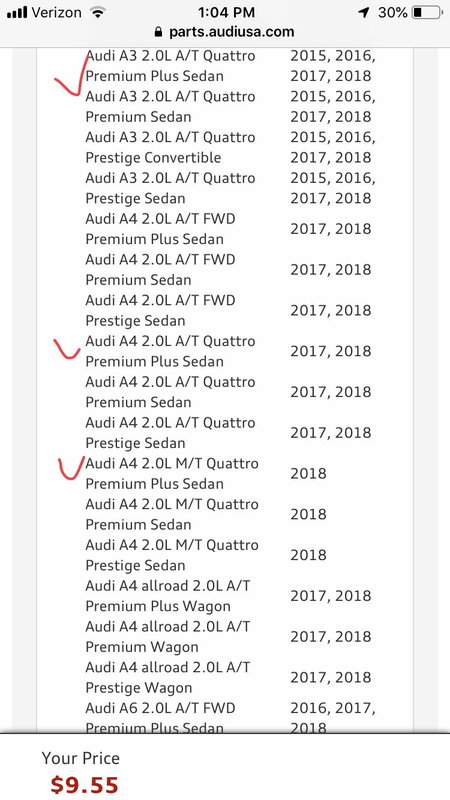 On the Audi USA Parts Search page it shows the spark plug fitting 8 different models, 116 variants between 2015 and 2018. My particular trim is a 6 M/T premium plus Quattro so that’s what I put in for the search. I’ve heard some install rs7 plugs into their A4s (although with different coil packs, but that’s a whole other topic). $10 per plug is very reasonable. With direct injection and turbo charge, copper plug will not stand the temp thus not applicable any more. Also, Coil pack over plug provide less voltage and will not enough to provide reliable firing with copper plugs. All cooper plugs need be changed about at 30k miles due to foiling. The OE plug for B9 A4 or similar 2.0T Audi or VW engines with part# 06K905601B is NGK PLFER7A8EG. It’s a Laser Platinum plug. Your reasoning against inferior plugs sounds convincing, but knowing VW is not a reputable company, per say. what's your take on the plug needing change at 40k? sounds odd to me.